I know…..I’m obsessed with florals, and red and pink are so good for the month of February! When I saw this I fell in love, and then when I saw the price, well….it was a no-brainer! 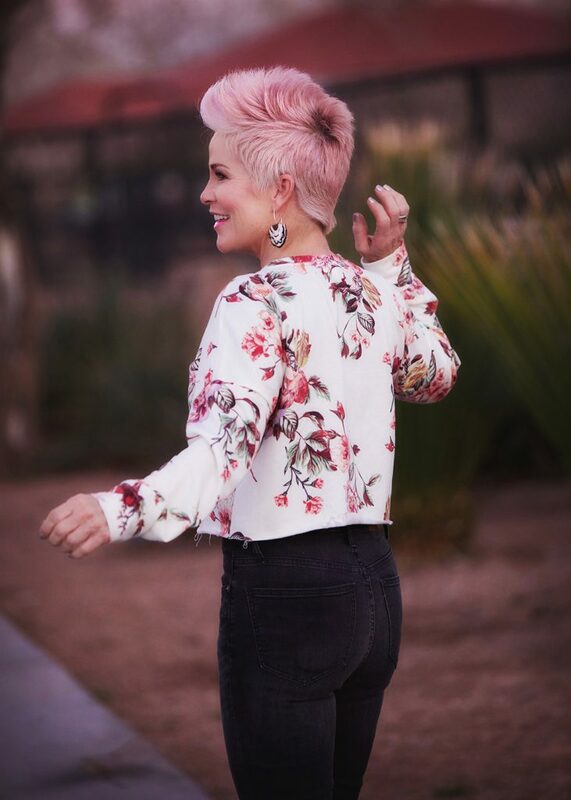 This is how I see it….with high waisted jeans, to yoga class over leggings and a tank, over a lacey summer dress, or with a frilly a-line skirt! The jeans are linked and from Madewell. I have worn them to death, several times every week! Remember on these to size down! The velvet embellished booties came from Zara, and not available anymore. I’ve linked some great substitutes though. And let me just tell you about this lipstick/lipgloss! It is such a great berry color called SPACE BUBBLE, with the perfect amount of shimmer!!! LOVE this one! The earrings I have on are my vintage Anthro pair, but the ones I’ve linked come in a bunch of colors, many of which would go with the sweatshirt! Do you have to have most of your topsshortened due to your petite stature ? I just found your site and I am so impressed. I sometimes feel that I am to old to dress like I do and then I see women like you and I feel great about my fashion choices. Just because I am older I don’t have to look that way. Thank you!!!! Love the pink hair. Hi Shauna, Just wondering what fashion trends for spring will you be following? Love following you, your such an inspiration!